Handcrafted in 120 steps and exquisitely finished in rich Wenghe wood. Fitted with a professional screw and knife, mirror-finished stainless steel and ergonomic long lever double curved handle. Comes with wood box. Made in Europe. Available Monogrammed or with Single Initial. The first hinge slides off when I attempt to pull the cork out. I don't have this problem with my corkscrew. Does this corkscrew work differently than other corkscrews? BEST ANSWER: This is a doubled hinged fulcrum and worm for extra leverage and smoother pulling.To start opening the bottle of wine you start with the ledge area closest to the fulcrum of the cork screw. You use that one to pull it as far out as possible and then use the lowest ledge to finish the job. This corkscrew is slightly different then a one pronged wine key. To start opening the bottle of wine you start with the ledge area closest to the fulcrum of the cork screw. You use that one to pull it as far out as possible and then use the lowest ledge to finish the job. where is this made, country? BEST ANSWER: This is made in Italy. Can 2 initials be engraved? Yes I would think there is plenty of room for two initials. My knife when it is in an open position it is not secure, as you put pressure on it to cut the foil on the bottle it moves? Is this normal? BEST ANSWER: Not to my knowledge. It doesn’t lock in place, but it’s tight enough not to move or slip. Should the lever swing freely or is it supposed to stay closed on its own? The lever should remain closed when not in use. I have Never had an easier time removing a cork from a wine bottle. As a matter of fact, the first time the cork came out so fast I spilled wine. With the next bottle I moved much slower and , bingo it came right out. Yes the price is high, but well worth it! This cork screw is heavy duty and will lift the cork our in two easy strokes.the price is half other on line prices! I have used this one often and I am impressed with the double hinge system, the knife, and the worm! This cork screw has some weight to it. Excellent product!! Very strange. Obviously a quality product in terms of materials and construction but it's like whoever designed it never actually tried to use it. The first thing that hits you is that it's HUGE. At least twice as big as a regular corkscrew. At first I thought this would be a good thing as I have large hands but it makes it very unwieldy to operate, especially with one hand. When open, it's about 8" long and it's difficult to keep it level and centered when screwing it in. The second issue that I had with it is that the knife is on some kind of hinge spring. Again, at first I thought "well, this is a high-end corkscrew, so maybe this is an upgrade" but it's just weird and dangerous to have the knife give a half inch when you are trying to cut the foil. The third and last straw is that the first hinge slips off the bottle when you try to pull the cork. At first I thought it was because with the first two bottles that I uncorked, the corkscrew ended up off-center (see comment above relating to unwieldiness) but that was not the case. It's like the edge is slanted upward, so that you don't really get a solid purchase on the edge of the bottle. As I said above, this is a well-made tool; feels good in your hand, no sharp edges, quality materials, attractive. It just doesn't work very well. This was a gift for our daughter who is in the industry. She works at WIlliam Cole, an exclusive winery in St. Helena, Napa Valley. 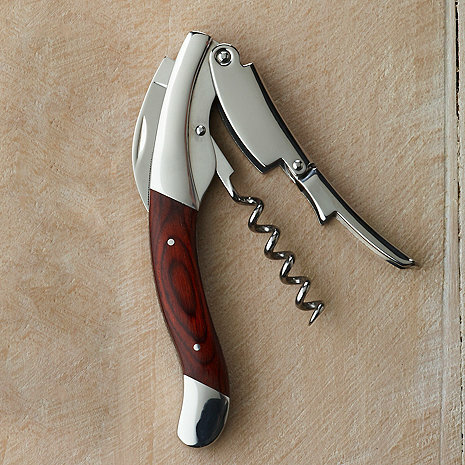 She finds this corkscrew to be attractive and sturdy while feeling good in her hand. It is well made, heavy and shaped to perform. Since she must open bottles with ease for her daily employment, she is delighted to have a tool she can rely on while at the winery, on the road or at home. This is a very sturdy wine opener and it is quite a bit larger than the typical ones you find. It operates beautifully! Nice gift for the wine lover that knows how to properly open a bottle of wine. This corkscrew fits well in the hand and works great. Highly recommended! On some bottles of wine, the indent kept slipping off the lip on the bottle. This is a quality work of art. However, I've been opening wine bottles with waiters' corkscrews for 40 years, and they all--even the $10 ones-- worked better than this one. The bottle lip simply won't hold the tool, which slips off the lip regularly. A slight notch on the tool would solve the problem, but sadly, it isn't there. It's large ! Solid, easy removal of cork with 2 stage, good serrated knife for foil removal. Received this Legnoart Ghemme Grand Cru this week and am delighted on how well the corkscrew works. The leverage of this corkscrew is fantastic and the quality of finish is beautiful. Once I have the foil cut, I can open a bottle faster than my wife's automatic opener. Love it! A truly magnificent corkscrew. The presentation box that it came in is a keeper. I gave this to my wine- loving husband as a holiday gift. He is a person who really appreciates quality and attention to detail. I'm happy to say he is delighted. The corkscrew is weighty, beautiful and works perfectly. Highly recommended, excellent value. Also, I had not noticed that it comes in a lovely wooden box which really adds to the gift. Well I use wine keys everyday, it definitley is quality and has a nice heavy feel to it. My only negative comment is on the first hinge, not sure if I am just not used to it but it is quite tricky to get it on snug. One has to push on the hinge whilst you open it, making sure it does not slip resulting in chipped bottle or injured hand. Maybe I just need practice. On arrival I was impressed with the presentation of the wood case. Practical with a magnetic closure it is also worthy of being given as a gift. Inside the fitted compartment the corkscrew is open for inspection. The fit, finish, and craftsmanship are impressive, especially for the price. The contour of the corkscrew fit my hand well as it is not small like most I was considering. The foil cutting blade has a serrated edge that makes short work of even the thickest foil capsule and the corkscrew itself is more than long enough. The only issue I have with it, and the reason I did not give it a full 5 stars, is I would like to see the two stage wing have a little more play between the first and second hook that rests on the bottle lip when pulling a cork. The wing is a two piece assembly but is pretty rigid and could benefit from being flexible enough to change angle a little more especially when pulling taller corks. Overall I am very pleased and would buy another. First stage doesn’t engage the lip of the bottle very well. Tends to tear up cork. Very happy with product. Works as expected. Nice case that is supplied with the product. I would buy again as needed. Superb product, well worth the price. This is an excellent product. It not only does the job it was designed to do but it looks great while doing it. It fits my hands well and is pleasing to the eye. I ordered two, one to give as a Christmas gift. Excellent product. Feels good in the hand, foil blade is very sharp, and mechanism has great leverage so corks come out easily. Reasonable price for a solid workhorse corkscrew. Perfect design for easy removal of cork. Love my Legnoart Grand Cru ! A precision tool that works consistently well & feels very good in your hand. The craftsmanship of this corkscrew is a sight to see. Will never need another corkscrew. Thank you Legnoart for your quality & high standards! Absolutely gorgeous. A practical, functional work of art. Even the box goes above and beyond expectations. The only thing I would have liked would be a belt or carry pouch. High quality works really smooth and delivered in impressive packagingð??? An elegant tool that does the job- with “panache”. From the moment you start opening the box, the product quality is apparent, i.e., a nicely weighted solid wood box, the magnetic box closure mechanism, and an exceptional art-like engineering design opener. It's a delightful moment, sweet! Then, you swiftly move to the opening a bottle of wine experience. The feel of the opener in your hands is graceful and the functionality is perfection. Just, a functional work of art. This is is excellent wine opener that is consistently easy to use. It also comes in a very elegant presentation box. It would make a great gift although I bought it for myself. IT DOESN'T HOLD THE EDGE OF THE BOTTLE WELL AND OFTEN SLIPS. Thought it was beautiful but gave it as a gift so I don't know how well it works. Wanted one for myself, but alas. . . Beautifully crafted, works well, a bit large. Beautifully made, works well. I bought it as a gift for a wine enthusiast. Why did I not rate it a 5? Because it is quite large and heavy, not something that fits into a waiters pocket easily. Shipping was as promised, item was in flawless condition. The recipient of the gift was very happy with it, but noted it was very large for a waiters friend." I saw one with a leather case that you could take anywhere. That is what I would need to give it a 5 star. Nicely finished steel and wood. Good attention to detail, the way the pieces fit together. The short indent would not hook on the lip of the bottle...slips off. Need more pronounced edge to stabilize. This corkscrew is poorly designed as far as functionality goes. It's too big, and the angle is off once the worm is in the cork--hard to get a secure pull. On several occasions I had to unscrew the worm because I could not get the cork out, resorting to a cheap waiter's corkscrew instead. Aesthetically, however, it's fine; still, I like a corkscrew that I can actually use as a corkscrew and not just admire for its sculptural qualities. generally works well in extracting corks, but is much bigger and heavier than I had imagined, and unnecessarily so in my view. wood finish and quality is nice. This is my second Legnoart corkscrew and the metal seems not at the level of my old one. Really hard to start the corkscrew due to the angle of the point. Not particularly well balanced. Multi stage opening is more hassle than help. I like my Carol Shelton wine club freebie MUCH BETTER. This item was much heavier than I anticipated. It's weight coupled with it's very slick finish made it difficult to use. I returned it and will continue looking for something else. I'm sorry, but I was not satisfied with the corkscrew and returned it for a credit; I found it too large and cumbersome. I was terribly disappointed and looked through your site for a smaller one but found them to be too costly. I realize due to the quality of the merchandise your company sells, had I purchased a more costly one it would probably be the last one I'd ever have to purchase. Not happy with this. I'd like to return it. May I?